Meet the creator of video games like Donkey Kong, Super Mario, and others! Shigeru Miyamoto, often known as "The Father of Modern Video Gaming". Shigeru Miyamoto was born in November 16, 1952. His parents were named Iijake Miyamoto and Hinako Aruha. His birthplace was Sonobe, in Kyoto, Japan. He joined Nintendo in 1977 as an artist, his native and unique style of developing storylines and characters brought him his big break with Donkey Kong, with many more to follow. He created a new Mario Bros game. It was called "Super Mario Bros". It was released in September 13, 1985. It was a monumental success to "Mario Bros". It extended the franchise to include a TV show, a movie, and even an anime film. Then, inspired by his love for nature, Shigeru created The Legend of Zelda in February of 1986. 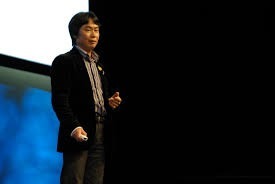 In 1997, Shigeru Miyamoto became the first video game developer to be put in the Hall of Fame of the Academy of Interactive Arts and Sciences. Shigeru Miyamoto has inspired video game developers and gamers with all his accomplishments.